Well lunacy got its first use as a way to describe the suspected effects of our Moon (lovely Luna) on human behavior. Luna, of course is the Roman Moon Goddess and it did not take long for early philosophers to assign strange human mental behaviors to the work of Lady Luna and lunatic has been with us ever since. There is no denying the many influences Luna has had on human history. One could fill an entire library with all the scientific studies, novels, plays, movies and music that talk about or talk to our Moon. For most of us, all the above represent deep expressions of endearment we all feel for Luna. In fact the Moon affects most of life. Wolves and dogs howl at Luna, owls hoot hello, bats dance in her light, some exotic flowers wait to bloom at her bidding, and legions of tiny creatures break into boisterous song upon her appearance. So, should we Earthlings be satisfied with just one, brief visit with Luna? Can we really be satisfied with that fleeting assignation and go galloping off to Mars and beyond? Now some serious space exploration advocates believe a return to the Moon at this point would be a bit loony when there is Mars out there waiting for us. Well, we will go to Mars, the important thing is how we go, and how well we stay there. The establishment of a fully active and fully international Lunar Research Base will offer a host of scientific knowledge that will directly affect all of our future space explorations. There are cosmic messages waiting to be discovered and read on Luna that relate to the evolution of our solar system, and most likely to the development of exo-systems like the newly discovered GL581 system. So, returning to Luna with an international team would be what we see as Lunar Smarts. Nothing loony and filled with both scientific and promising commercial discoveries that will hold promises for both research and private development. There will be obstacles, even life threatening ones, as well as revelations about humans existing functionally in the rather unfriendly environments of Luna and certainly Mars. What is learned in working on Luna will better ensure a safe and highly productive exploration of Mars and beyond. All of these lessons will be provided at a lower cost, than a gallop to Mars that is fueled more by “guts and glory” than by careful and concentrated scientific investigations. Of equal importance, is that while we are learning on Luna, when serious things happen that need rescue, it will come quickly whereas on Mars, it most likely will not come at all. This development will not deter our exploration of Mars, but when we do make the trip we will go with extensive Lunar foreknowledge and an established rescue protocol based on time and distance from Earth. Lastly, if we bypass Luna, others will not, and we will immediately lose any leverage about what should happen both scientifically and commercially on our only Moon. Those kinds of assessments and decisions should be derived and followed internationally. We can assure that only if we, this nation, take the initiative to bring it about in an orderly manner. If we wait and in a startled and rushed response seek to resolve that problem. it most likely will fail. Brave men, dedicated support staff, tons of money were spent to visit Luna. Let us not waste all of that great achievement by casting aside those first, magnificent steps across the wide, wide river of space. Luna awaits with open arms, a greater supply of water than we initially thought, and as stated above a glorious and important history lesson about how we all came to be. So lets be Lunar Smart and set sail, soon, for lovely, lovely Luna. 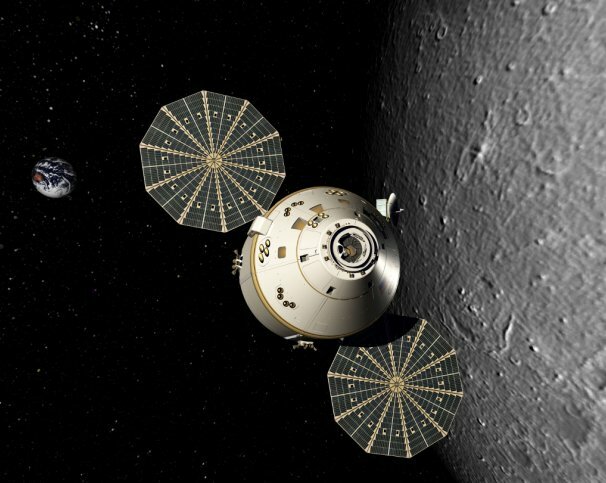 IMAGE CREDIT: Image of Orion spacecraft approaching Luna courtesy of Lockheed Martin Corporation. Yes, this is a highly prejudicial blog article. It is pro-science and definitely proposes new ways to both strengthen America‘s SciTech prowess and at the same time elevate the general well-being of humankind globally. Some, kindly, would term this as a solicitous appeal while others would…well? In a rampage of proposed budget slashes a deficit threatened government reacts instead of carefully enacting. Yes, enacting would address the deficit, but in a manner that sustains the core strengths of America. One of those most important core strengths is our scientific and technological prowess. Put simply, can this government sustain itself and this nation without progressive science and technology? Similarly, is there much hope for this progressive and vital core without an equally progressive government? Truly, these are inseparable partners with a desperate interdependence. President Obama in his 2012 budget proposal increases Federal spending on SciTech by 13%. On the surface this appears good and progressive. What is not clear is where that increase, if approved, will be applied. Additionally, one must wonder where the justifications came for that increase. In other words what SciTech advice was used to make that determination? The White House and the Congress have many resources, but there are also strong inputs backed more by whimsy and illogic that solid justifications. Most of this kind of response seeks to degrade SciTech and in doing so pushes the nation backwards. On the positive side input from strong sources, including the Congressional Budget Office, the White House budget staff, the National Academies of Science, the National Science Foundation and a host of private and university research organizations all submit supporting data for their fiscal needs. As critically important as full funding support for SciTech is, an exclusive focus just on that issue is dangerously and terminally myopic. Yes we need to finance a full spectrum of research, including space exploration, but for this to become a fully acceptable and supported standard we must pull down the walls of scientific exclusivity. At the same time we must break through the barriers of suspicion, superstition and theological extremism that blockade SciTech progress. These are false adversaries promoted mostly by political opportunism. That’s right it comes far less from the pulpit and more from wild-card politics. The common ground is the deep spirituality that comes from new discoveries and explanations that enrich and elevate humankind and all that surrounds us. Science does not defy us, it continue to define us and in doing that we grow and evolve and glorify our place in the Cosmos. Regardless how you chose to justify it, humankind has a mission and now we spend more time denying it and its rewards than we do in seeing the light of discovery that is shining in our faces. There is so much astounding beauty and exciting revelations out there that our SciTech selves help us to see and appreciate. It is only the unexplained that imposes fear and suspicion. With each new revelation provided by SciTech, humankind moves forward, but also closer together. Here is the essential connection. Government must be of and by the people, and science promotes an ever-expanding environment that enhances our surroundings and thereby improves human life. Stop science, and life then diminishes and thus governance – thus extinction Shall we vote for extinction through both poor financial management, and even poorer use of our ability to explore, discover, and thereby explain? Good governance that promotes assertive SciTech, unifies humankind with the Cosmos. SciTech and governance together from now on work to forever protect and espouse this unity. Is it mystical? No, there is no mystery. Is it spiritual? Absolutely, each new revelation strengthens us and provides an incredibly deeply spiritual sensitivity for each other and for all that surrounds us. SciTech is vital and governance is its essential promoter and protector. They are truly inseparable. Banish either and we banish humankind. 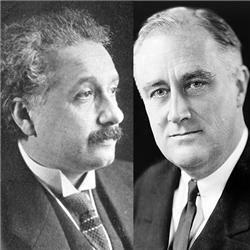 BLOG NOTE: The following is a reprise of an Op Ed piece I submitted to the “Christian Science Monitor” during the public action to support the upgrade of the Hubble Space Telescope to keep it alive and well. I repeat it here as history and in tribute to our astronauts who stepped up and reached out to keep Hubble sharp-eyed as ever. Growing up in the mountainous regions of Arizona meant that on any clear night I could step outside, lie back, look up and wander the universe. Now, many years later, I am a city dweller blinded by light pollution, but still longing for those starry, starry nights. Enter the Hubble Space Telescope and I am home again. Using Hubble’s discoveries, I go deep into the universe. Galaxies and nebulae are not simply bright whirls of light, they are each a universe unto themselves and all equally awesome and compelling. The telescope also takes me to places never conceived or seen by anyone, and I then know just how Galileo felt. The instrument is also a time machine taking me back millions of years, and close to the beginning of everything. In wonderment, I guide my computer through these Hubble moments, and I become choked with emotion, as I realize I am traveling deep back into time to our beginnings. Darkness is again on the horizon. They, our government, are talking about letting the Hubble die. The telescope requires regular upkeep and upgrading. Our astronauts using the space shuttle have successfully done this four times in the past. 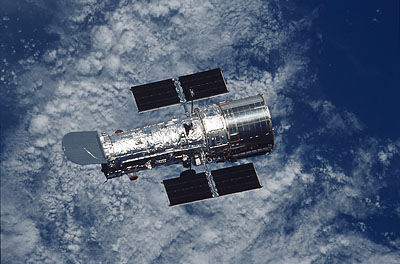 Now, as most of us have read or heard, Hubble is due another upkeep. Without this upkeep it will soon run out of energy and its probing eye on the universe will close forever. Claiming anxiety over the dangers of a shuttle flight to the telescope NASA’s leadership continues to stonewall everyone including Nobel Laureate scientists who advocate saving the Hubble. Today, both scientists and politicians twist and turn in efforts to either defend NASA’s decision or argue for full restoration of the budget and the servicing mission. Costs ranging as high as I billion dollars have been reported in committees and in the press, but the real incremental costs for the mission remain as originally budgeted, between 300 million to 400 million dollars spread over four years. Most importantly, the money is there, it has just been pulled out of the Hubble account. So, why all the worry and fuss? There are certainly many powerful new telescopes in the works that can see as well or better than the Hubble. This is true, but there are several key factors to consider. Those other powerful eyes are on the horizon. They are not yet fully in place and at work. Hubble is on station and at work. Many of the other telescopes are far more exclusive with respect to shared information than the space telescope program.. The very manner in which The Space Telescope Science Institute manages Hubble’s discoveries have made it the “people’s eye on the universe.” These people are from all over the world and they are both novices and experts and all treasure the space telescope’s astounding revelations. Some politicians and scientists say Hubble has completed an astounding job with amazing discoveries implying that it is finished. This is not so. It is not what we already know, but what Hubble is yet to tell us that is so critical, and the universe won’t wait while we ponder the telescope’s future. There are many reasons why the Hubble must be kept alive and on station, but for me, the words of our astronauts who put this instrument in place and have kept it alive say it best. We must keep this eye on the universe. Save the Hubble. UPDATE NOTE: Fortunately, as we all know, the upgrade mission was approved and STS125 carried those dedicated and courageous astronauts up to keep Hubble alive and well. If you would like to view that petition to President Bush you may do so here. As you read over it, look up and send best wishes to our esteemed eye in the sky, and send both cheers and applause to all those astronauts who stood tall for Hubble. 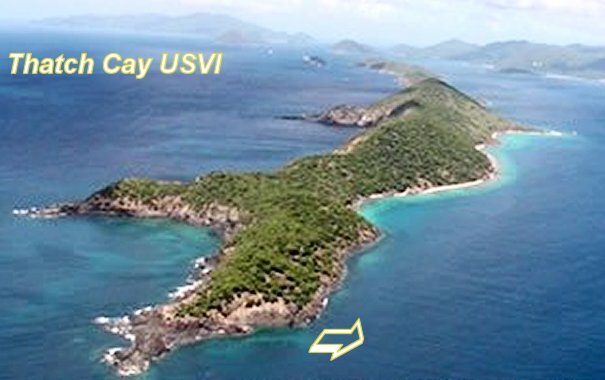 The image above is of Thatch Cay a small island off St. Thomas of the U. S. Virgin Islands. This is where we all took the flight we shall always remember. It was December 24, 1981 and the four of us were in a great holiday mood. It was then we decided we needed to go diving, but at a very quiet and peaceful spot. The small island, Thatch Cay, within the U. S. Virgin Islands was ideal. It was rarely crowded with snorkelers and divers and had a number of glorious coral communities in the half-moon bay on the Atlantic side of the cay. We headed out for Thatch Cay and its lovely bay. It was an absolutely glorious day. The weather was perfect and our dives in the bay area was so peaceful. We had the area all to ourselves; well except for all the friendly fish that joined our exploration. Of course, their friendliness was inspired by the little waterproof sacks of dry cat-food we brought with us. The fish love it, and they were all around us; even aggressively brushing against us to hurry us up to hand out the snacks. The idea of fish eating cat-food always makes me chuckle. Since the dive in the bay took us to around 70 feet we cut it short because we also wanted to dive along the other side of the cay. We dove in the area just to the left of the arrow shown in the above image. That was the Caribbean side and the coral reef there was different, but strikingly beautiful and full of life. We were very careful to not create disturbing currents around the coral life with our dive-fins. Of course, some of our fish friends from the other side had followed us around to the second dive site. Characters all of them. They are like house pets and just as apparently affectionate. In settings like the ones we were enjoying, it is very easy to ignore your dive time and air status. I learned my lesson about this the previous year when I was so fascinated with a dozen or more Barracuda that had surrounded me that I ran out of air. I was at 90 feet! Fortunately my dive partner. a young lady, had air to spare and an octopus rig, so we shared her air as we ascended and returned to our boat. Dive partners are an essential both for safety and shared enjoyment. So, taking that lesson seriously I beckoned for all of us to begin to ascend and head for the boat. As we were swimming up and toward our boat, on our right there appeared 9 very large and very relaxed Manta Rays, swimming along in loose formation. We immediately turned an swam towards them. 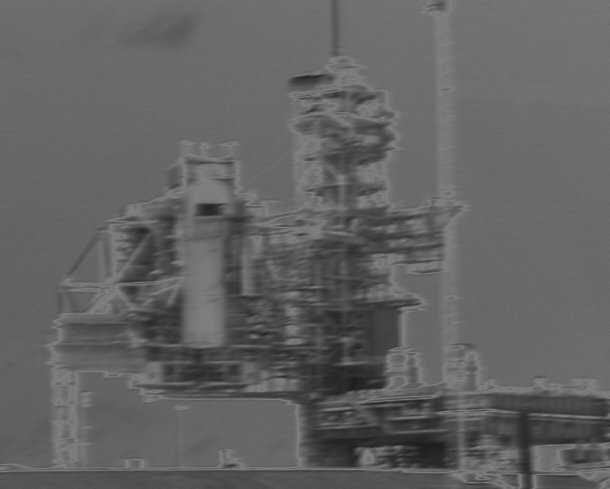 This was in the area marked by the arrow in the above image. They did not shy away, but instead spread out a bit and appeared to welcome us as we joined up and begin to swim with them. Actually it is more like flying with them than swimming. These gentle giants, and members of the shark family are so magnificent, and here we humans were sharing space and time with them in their glorious universe. I looked across at my dive partner, a beautiful, casting director for major motion picture companies, and saw that she was alternatively smiling and crying as we swam up close and personal with our ray escorts. Well, I was so excited I was sucking up air at a monstrous rate, so I knew I had to surface. I did so with regret and sadly bubbled goodbye to our Manta Ray buddies. When we all got back to the boat, we just sat silently, not saying a word. It was obvious that we were deeply affected by what we had just experienced. To be welcomed so completely by another life form, in their environment was emotionally overwhelming and unforgettable. We remained silent even during our trip back to St. Thomas and it was not until we were ashore that we reached out hugging each other, laughing, wiping away tears and each vowing to never forget our brief and glorious adventure. We had been in another world where we shared flight time with some of its most gentle and friendly citizens. If you wish, click HERE to view a video that will give you a small taste of what we experienced. May it also leave with you, even vicariously, a deep and lasting appreciation for all that surrounds us here on Earth and throughout the Cosmos. The multi-lingual calls to return to the Moon shown in the above image are just a few samples of the many other national languages all calling for a revisit to lovely Luna. Well Russia is gearing up for it, China too and one must ask, why this nationalistic attitude when we could all work together? We could be combining scientific and technological brilliance with shared costs to create the second greatest International Space Station: The Moon. Yes, everyone wants to go to Mars too, but a second International Space Station located on the Moon would be a significant step forward in the bolstering of an already international climate for joint space exploration programs. The diplomatic breakthroughs in putting this joint effort into being would also be an incredible leap forward toward global peace. It would also be a definite enhancement of humankind‘s continuation on this planet and beyond. In other words we learn to live and work together, thereby living longer and reaching further into space. Seems like an awfully good idea. This big event would most likely be a joint activity of both governmental and commercial programs all joined together for a common goal. The sharing of technological expertises as well as the sharing of the ongoing costs for such programs mandates a global consortium. There is no question that we can do it. The only question is will we even try? It is natural for humankind to be competitive, but it is also natural for us to come together and succeed jointly. History certifies this fact. So, lets make history again. There are already solid, cooperative links between many of the space-faring nations. We should use those as the foundation upon which to build the WILR – the World Institute for Lunar Research. The biggest step is for each space-faring nation to give up the desire to be “first” and instead accept a joint “first place” for all humankind. In other words a world full of heroes, with an international flag implanted on the Moon’s surface. When we accomplish this we will ensure that not one single astronaut/cosmonaut that has visited space ever did so for naught. Now is the time, while all space-faring nations are scrambling to keep some level of space exploration alive. Sub-dividing that effort nation by nation is a starvation diet. If we come together our joint efforts will both survive and prosper. Let’s do it! Давайте сделаем это! Faisons-le! चलो यह करते हैं! Hebu kufanya hivyo! HEADER IMAGE: NASA image of astronaut Bruce McCandless II who performed the first independent space walk. Look how far humankind has come. It has not been easy, and it still is not easy, but fortunately there are those among us who persist and thus succeed in carrying all of us safely into the future. As expressed in an earlier blog article, Exploration;An Essential of Life, humankind is here today because of a basic biological drive of all life to reach out and explore its surroundings. Most probably that is exactly what brought humans up from the sea to where we are today. Most importantly we are not finished! We are surrounded by life, by energy, by natural phenomena that challenge and enrapture us. We cannot ignore their existence because we are part of it all and are driven to explore and understand. If or when we were to turn away, we turn away from ourselves. That vital transition then is to accept the reality that we are all connected in many different ways including the entire Cosmos. This realization should be both assuring and exhilarating. Everything we do, everything that surrounds us, everything that happens in and around us is all interrelated. Sure, there are some scary parts, some mysterious parts, but there are also a multitude of inspiring and engaging parts. Summed together they represent our place in the Cosmos. To fully appreciate that relationship we must explore all that surrounds us. In exploring, we then discover and in discovering we then are compelled to explain. As we explain we add to or create science, and science is the foundation of our understanding of who we are and why we are here. Fear disappears and suspicion and superstition are banished by reason and fact. A sense of insignificance is replaced by an awareness of our cosmic citizenship, and our important roles as explorers and explainers. We are essential, but incomplete without our acceptance of our unity with all that is the Cosmos. When that realization happens we are uplifted in joy and fulfillment. We are Cosmos. The following video gives you an opportunity to enjoy a moment within a part of all that surrounds us. Image of Astronaut Bruce McCandless II who performed the first untethered space walk. Courtesy of NASA.